Got some leftover rice from last night? Or some in the freezer? Well you could do a lot worse than using it as the basis for this completely inauthentic, but insanely delicious, dish. I hesitated calling this recipe Indonesian, so I settled for Indonesian-ish. 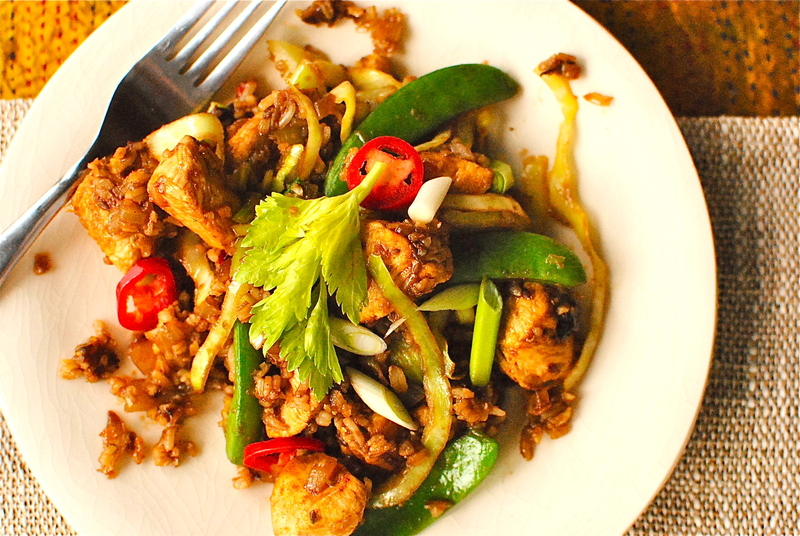 This glorified stir-fry has overtones of northern China with the cumin seeds, and India with the turmeric. But really it is just my more vegged-up version of the Indonesian national dish, Nasi Goreng, which means ‘fried rice’ in Indonesian. A typical nasi goreng is a very simple breakfast dish of leftover rice, some kind of meat or seafood, chillies or a sambal sauce, sugar, garlic, often tamarind, and the all important fried egg (although even that gets it the name ‘special nasi goreng’). Some versions will have dried anchovies – nasi goreng ikan bilis. I have had numerous nasi goreng but never in Indonesia itself. This may be the closest I get so I’ve tried to make it as flavoursome, but still easy, as possible. If you have the wherewithal and time you can tart it up further with fried shallots and garlic, shreds of cucumber, cabbage and tomato, as well as acar, the distinctive spicy and sour pickled vegetables that usually accompany restaurant-made nasi goreng. Krupuk, the light Indonesian version of prawn crackers is another accompaniment and are relatively easy to find at larger supermarkets. I have also chucked in the rather inauthentic addition of lime leaves as well as kecap manis, a salty molassesey condiment popular in Indonesia. I really like contrasts of flavours in most dishes so I popped these in to balance out the hot and savoury of the nasi goreng base. Leave them out if you like. But if you trust me with these off-piste inclusions I hope you feel suitably rewarded. Let me know. 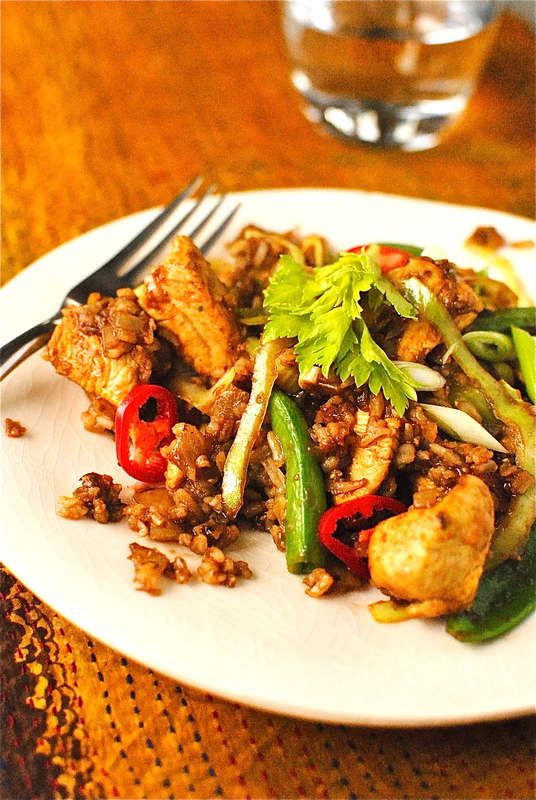 If you don’t think you will use the kecap manis in other dishes, like babi kecap (delicious! ), then save yourself some ingested preservatives and money by making your own – two ingredients: brown sugar and dark soy sauce. Just a word of advice – which I’m sure you don’t need but I’ll put it out anyway – have all your ingredients chopped and ready to go, with the rice cooked and cold. Just 10 minutes prep and this recipe will be an absolute breeze. Chopping and hunting down the store cupboard ingredients as you go is a quick road to frustration with possible cursing. So clear a wee space on your counter, arrange your measured spices before you and whap out a chopping board. You may not think you are in Indonesia but I promise your tongue and tummy will think they are. I’m linking this up to Cheryl at Tidy Mum’s Lovin’ It roundup. Lots of crafty and foodie links! And also to the all-homemade Cookin’ With Luv over at Javelin Warrior. No claims for authenticity, but this Indonesia meets northern China meets India rice dish is delicious nonetheless. And very easy to make. 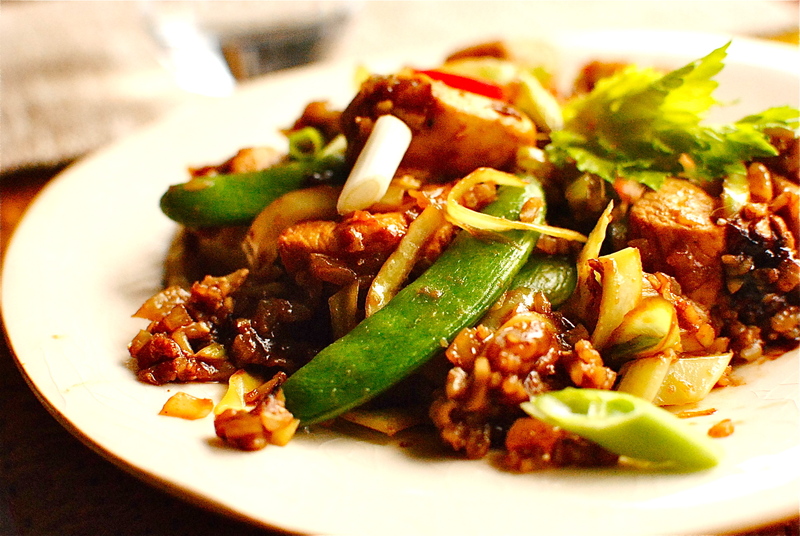 If you like, change up the protein – tofu and cashews, pork, chicken, beef – and play with the spice levels. Perhaps leave out the chillies if serving to children, but have them chopped and raw to add as a garnish, as well as finishing with spiky Sriracha sauce. The only sacrosanct advice I have for this recipe is to use cold cooked rice – it really makes a difference – and to have the veg all chopped and ready to go. If you are making the kecap manis (Indonesian sweet soy sauce), have that ready too, although it only takes a piddling five minutes to make. In a large bowl mix together the meat/tofu with the cumin seeds/powder, turmeric and coriander. Heat 1 teaspoon of the oil in a wok or large sauté pan and quickly cook the turkey or other meat/tofu until browned. Set aside. Add the remaining oil to the pan and, over a medium heat, stir-fry the onion, garlic, chillies and ginger until the onion is translucent and soft – about five minutes. Stir in the sugarsnap peas and cabbage and continue to stir-fry until the cabbage browns in places. Stir in the cooked rice and the turkey and mix well, continuing to stir-fry for a couple of minutes. Mix together the kecap manis, the tamarind paste or lime juice, and the lime leaves/zest and add this to the stir-fry, mixing well but carefully. Let this cook into the stir-fry for another minute or two before dividing between four plates. 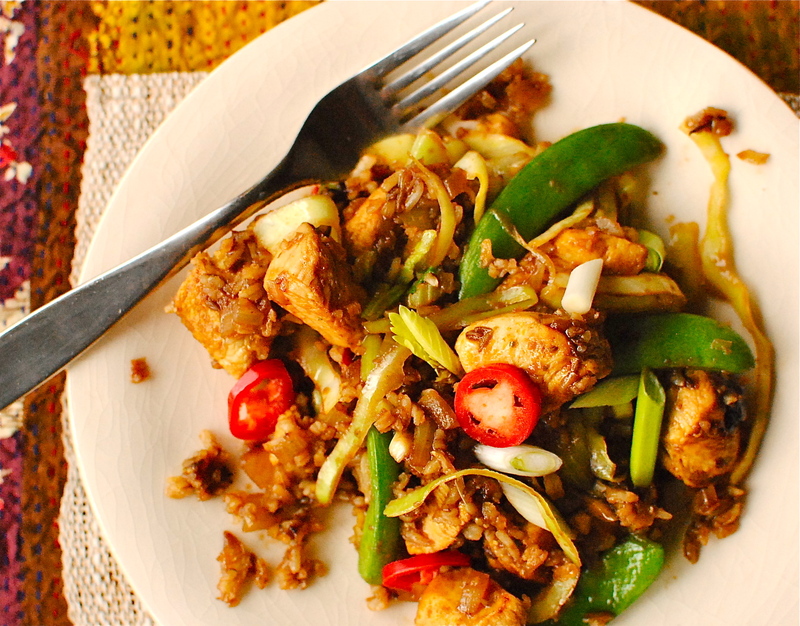 Garnish with chillies and spring onions. Other garnish ideas would be a fried egg, fried shallots/garlic pieces and Indonesian crackers (krupuk). Heat the soy sauce and the sugar until the sugar melts and the mixture just starts to boil up. The sauce keeps for a week in the fridge. Well, let’s fix up a lunch date & I will make it if you like. But not much beats perfectly cooked tuna…. This sounds so crunchy, fresh and delicious, Kellie! I am from Malaysia, that looks yummy! I take that as a huge compliment. Thanks! Amazing – I want to eat this now! Thanks Miss Alyssa! I wish I could make it for you x IF you are ever in Edinburgh…. It looks very authentic-ish, and more importantly beautiful and tasty – and it sounds like it would have a lovely balance. I was just at an Indonesian restaurant last week (a stones’s throw away from Indonesia) and this would have fit right in (and the tofu version would have been a very welcome addition to the sea of meat on offer). The combination of flavors and ingredients in this dish sound fantastic, Kellie – packed with flavors bursting with healthfulness! It sounds like it would be quick to pull together, especially if you’ve cooked the rice in advance… I’ve been so busy the whole weekend moving into a new place I haven’t had a chance to cook much of anything, but a meal-in-one like this would be perfect 🙂 Thanks so much for sharing! Thanks so much! It is very flavourful, perhaps too much so for some, but some fussy friends of my daughters gobbled it up the night before last. That’s a great feeling. One of them until recently only seemed to want to eat tortilla chips or cheese sandwiches! Oh, and I hope you two are settling in very well by the time you perhaps read this reply. So exciting! It’s a great wee trick. I keep a jar in the fridge on standby for fried rice & babi kecap (with tofu, not pork) emergencies. Another great vegetarian dinner idea! Bright with festive flavors and lush with vegetables, a marvelous recipe! I’ve eaten a few nasi goreng in my time and but they have been rather bland compared to your “flavour-tastic” version. It’s got lipsmackin’ goodness written all over it Kellie! Delicious recipe! Thank you Jacqueline. It’s a crime for nasi goreng to be bland. Maybe the purveyors of such dull fare think British people can’t handle spices and deep flavours. Still, a crime against tastebuds. I used to have a takeaway every weekend but now I am on a diet, this will easily replace it. That’s Saturday’s tea sorted. Well this has very little added fat so it should fit right in with your diet. And the protein-starchy carb balance is good to, so very satisfying with smaller portion. I hope you put in on your weekend menu soon! Hi, Just nominated your blog for the Kitchn’s Best healthy blogs at the Homie 2013. Hi Kellie, I’m including a link to this post in our weekly Bali’s Good Food Scene ePaper: http://paper.li/epicurina/1356994624, I hope you don’t mind. Thanks for including me. I’m flattered! Yum! Thanks for sharing! I love Indonesian food (my step-mom is Indonesian) and have to make my own because there isn’t a store near me that carries it! Kellie, I made this last night – really enjoyed it a lot. Will definately make it again – – even for my husband! I really like your recipes because they are flavor-packed. A lot of healthy food is bland, boring, plain. Thank you so much! Do you ever write about your work and the response you get from your patients about your food? I would be so interested to find out how a change in their diet has helped them. Awesome! Thanks for that 🙂 Because of the turkey you hubby hopefully will like it, if he likes things a little spicy that is. And no, I haven’t written about my work in too much detail. I may do, especially as my new-ish weight management classes for post-treatment weight gain have been pretty successful. Not about a diet as such but looking at emotional side of eating plus encouraging and demonstrating filling, satisfying plant-based cuisine. We are trying to set up a study based on my programme. So watch this space!